The police arrested eight youths from Peeranwadi village, on the Belgaum-Goa NH-4A in connection with razing down a temporary shed which was brought down. The temporary shed was put up for praying during Ramazan on an empty plot and when on early hours of Saturday the shed was brought down by some miscreants, tension engraved when people started to gather around the place in the morning. However the police interfered at the right time and got the situation under control. 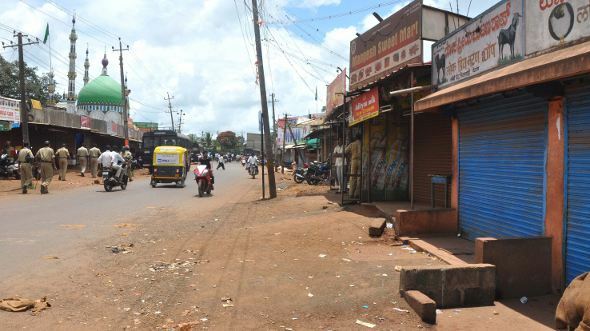 Rumours of communal violence resulted in most shops in the village remaining closed for the day. But nothing of this sort actually happened and people have been asked not to heed rumours of any kinds. As a precatuionary measure section 144 has been imposed in Peeranwadi, Market and MalMaruti Police station areas until August 27. Belgaum city well known for climate, education, industry and last but not the least Peace, but in recent days the scenario of Belgaum has changed it has got divided on the basis of Language, Caste and Border issue. Everybody has their own stand and they think they are right. Small appeal from bottom of my heart leave far away the hatred and the misunderstandings we all are one. Be good to others and others will be good to you.